Several recent incidents involving nose landing gear (NLG) cracks and leaks on Beechcraft 1900D airplanes prompted the NTSB to issue three safety recommendations. On May 17, 2011, a Beechcraft 1900D, N218YV, sustained minor damage when the left main landing gear (MLG) collapsed during the landing roll on runway 35L at Denver International Airport (DEN), Denver, Colorado. There were no injuries. 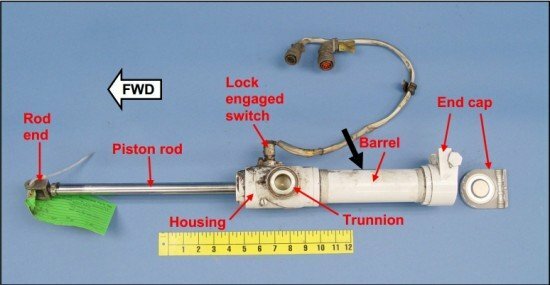 The NTSB determined that the probable cause of the incident was the fatigue failure of the NLG end cap, which resulted in insufficient hydraulic pressure to secure the left MLG into the down-and-locked position. During the investigation the NTSB learned of five previous NLG end cap failures. Altough the maintenance manual was changed, two additional instances of fatigue cracks of NLG end caps on Beechcraft 1900D airplanes had occurred. The NTSB concludes that the repetitive inspections using the current Hawker Beechcraft-developed and -approved method are not capable of detecting subcritical fatigue cracks in the NLG end caps. Without an effective inspection method, the 1,200-cycle inspection interval is not adequate to ensure that cracks are detected before failure occurs in service. Therefore, the NTSB recommends that Hawker Beechcraft Corporation revise the Beechcraft 1900D NLG end cap repetitive inspection procedure and time interval to ensure that fatigue cracks are detected prior to failure and issue updated guidance to operators regarding the inspections.